John L dropped me a line, he needed to replace a duff rear brake cylinder on his Opel Manta A series. 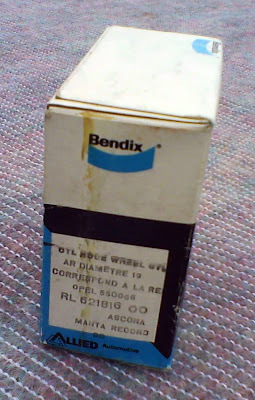 I recommended changing both to ensure even braking and luckily still have a fair few of Bendix made items to clear. Bendix is not a common name among aftermarket parts suppliers, but I used them on one of my own cars about 8 years ago and they're holding up just fine. I was able to package them up and out the same day, I then did a quick stock check and there are just enough to service five more cars. The label on the box lists them as being suitable for the Ascona, Manta, Rekord and CD (the Bitter made coupe I assume). Should you fancy a pair, they are £15 inc UK delivery.